While many Windows users have only heard of the Disk Cleanup and Disk Defragmenter tools to optimize computer performance, there is still yet another tool built-in to the Windows operating system that you can use. Microsoft’s Error Checking utility checks the integrity of the files stored on your hard drive and will attempt to automatically fix file system errors and recover bad drive sectors. 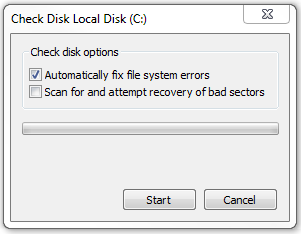 To explain, as you use your computer and hard drive, over time the drive can develop bad sectors (a section of the drive that can no longer be successfully accessed by Windows, usually due to permanent damage). Running the Error Checking utility alerts Windows to these problems and prevents your system from storing data in these areas in the future, which subsequently can improve your computer’s performance. Microsoft recommends that if your use your computer daily, you should run the Error Checking utility at least once a week to help prevent data loss. Close all open windows and files. Select Start, then Computer (or My Computer in Windows XP). Right-click on the hard drive that you want the utility to scan. Select Properties. When the Properties dialog box appears, select the Tools tab. Click Start and allow the scan to complete. If bad sectors are found, choose to Fix them. If the primary hard drive for your Windows computer is discovered to have bad sectors, fixing them with the Error Checking Utility should help you notice some improvement in the performance and speed of your PC. 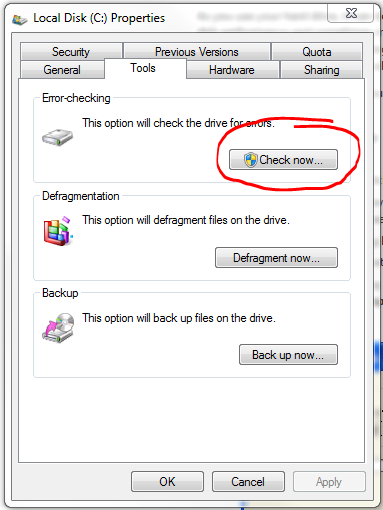 In addition to using this utility, you should also regularly perform Disk Cleanup and Disk Defragmentation on your computer. If you would rather automate the process of performing Windows Disk Cleanup and Disk Defrag, sign up for Free Computer Maintenance. Our free software will take care of all your essential computer maintenance tasks, freeing up more time for you to actually enjoy using your computer, problem-free. Sign up is easy, and did we mention it’s completely FREE!